Not saving enough for retirement and outliving their retirement savings are the biggest financial fears and regrets of Affluent investors, according to Spectrem Group research. So it is not surprising that for nearly nine-in-ten (89 percent) of retirement plan participants, honesty and trustworthiness are the most important criteria in choosing a financial advisor. Eighty-five percent of retirement plan participants surveyed by Spectrem Group place the highest premium on a financial advisor’s transparency and being kept in the look on what they are doing in regard to their investments. 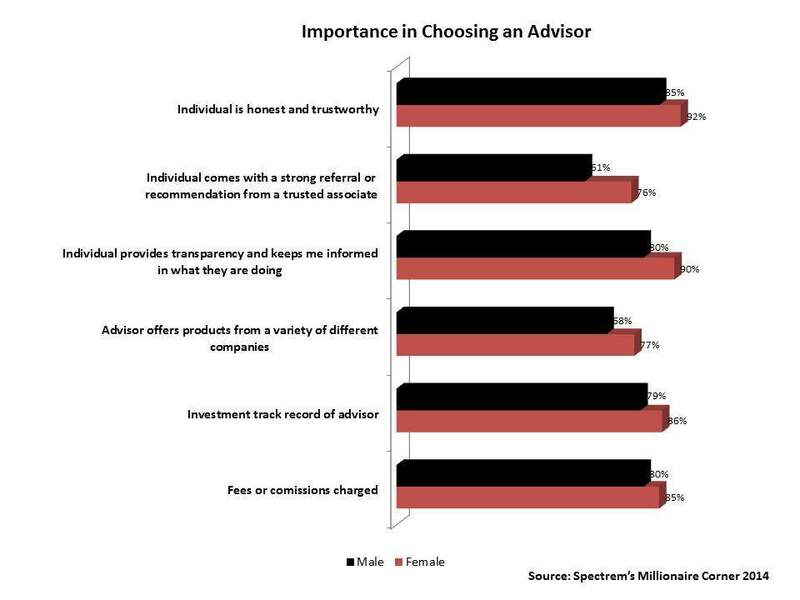 For eight-in-ten, a financial advisor’s investment track record and fees or commissions charged are the most important factors in choosing an advisor. Other factors retirement plan participants consider important when choosing an advisor include having access to products from a variety of different companies (73 percent), website and online services offered (63 percent) and the renown of the financial advisor’s brand or company (61 percent). Not surprisingly, honesty, trustworthiness and transparency are a heightened priority for Baby Boomers ages 50-64, Spectrem Group research finds. Nine-in-ten of retirement plan participants in this demographic consider these of most importance in choosing an advisor. Millennial investors, on the other hand, are most likely to take into consideration a financial advisor’s track record (88 percent). Very surprisingly, the highest percentage of surveyed retirement plan participants most likely to place primary importance of website and online services offered (70 percent) and use of social media platforms (24 percent) are seniors over the age of 65, who are generally considered to be less tech-savvy than their younger counterparts. Women tend to self-report less confidence than men in their investment acumen, Spectrem Group research finds. The unique financial challenges they face, including unequal pay and interrupted careers to care for family, make retirement of heightened concern. . Thus, they place more importance than men on a financial advisor’s honest (92 percent vs. 85 percent), transparency (90 percent vs. 80 percent) and whether a financial advisor comes with a strong referral or recommendation (76 percent vs. 61 percent).